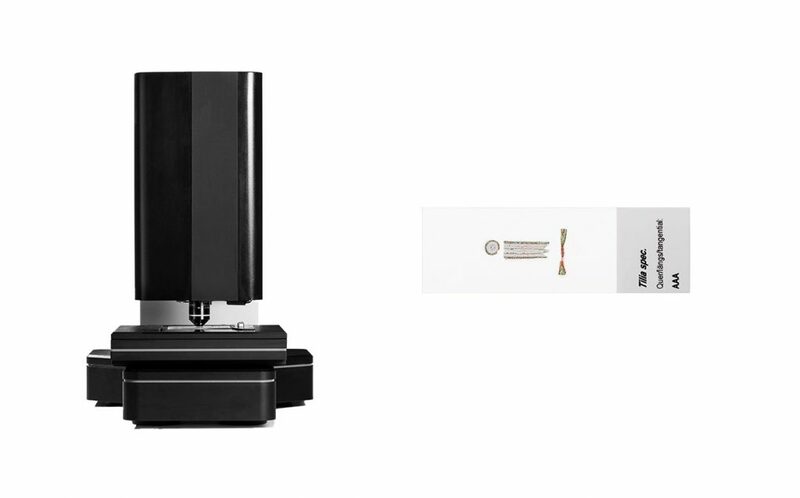 "Live Stitching with Real-Time Z Focus"
PreciPoint’s M8 is a dual purpose microscope and whole slide scanner with live REMOTE CONTROL functionality. 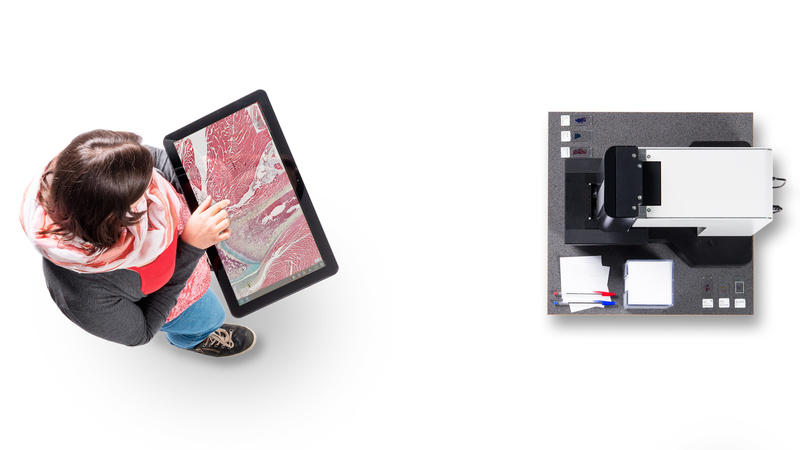 All features are accessible via a touch screen computer – making it a truly “hands on” digital microscope. 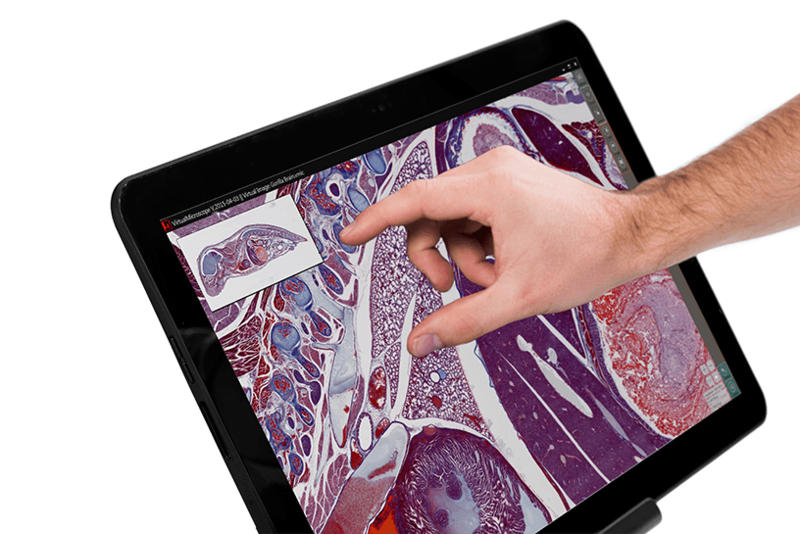 The intuitive software allows for easy navigation through your microscope slides with just the touch of your fingers. Perfect for FROZEN SECTION consults. With everything automated and digitized, there is no need for oculars and manual focus knobs. Working with a touchscreen computer, a tablet, or a smartphone makes you feel as if you could examine the sample with your own hands, literally! 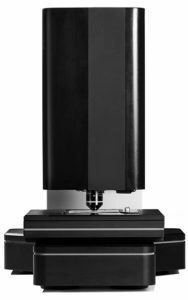 The M8 is the most ERGONOMIC and INTUITIVE microscope-scanner on the market today. Period. 1x-400x Zoom and Live-Stitching makes changing objectives unnecessary! The secret to the PreciPoint’s M8’s power and appeal is its incredibly fast LIVE STITCHING feature. You zoom seamlessly through the slide as if you could examine the sample with your own hands. 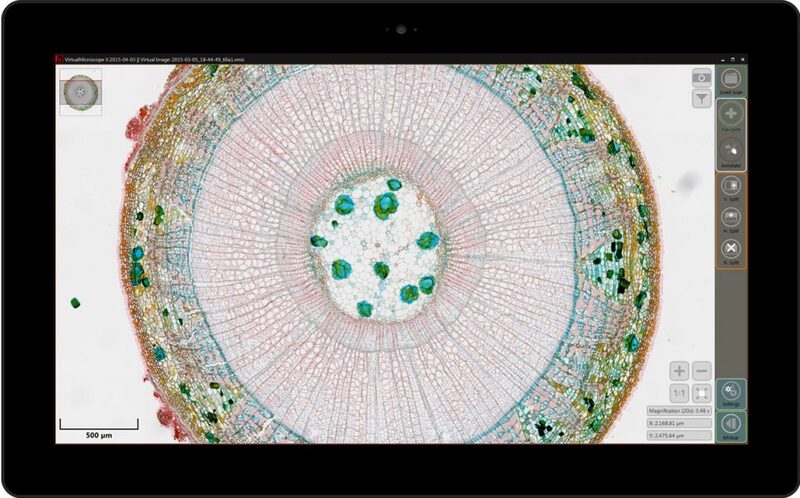 While doing so, our live stitching feature CONCATENATES individual images to a full screen high resolution picture, making your work easier and faster. 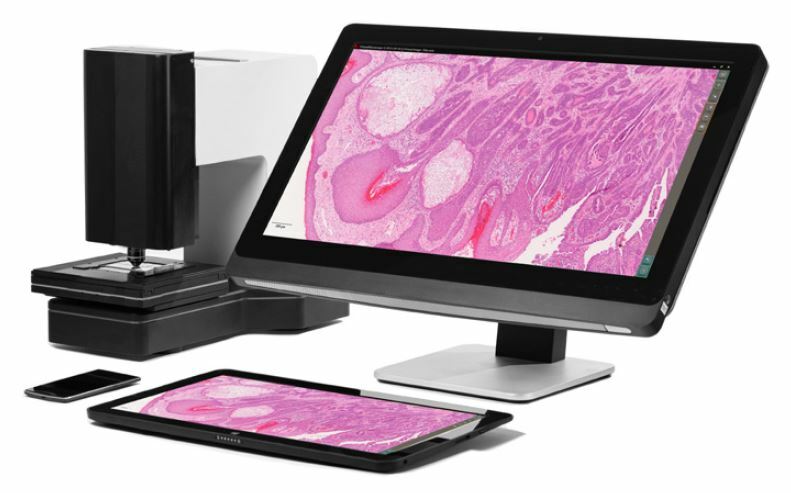 Pathologists can REMOTELY zoom, pan and scroll INSTANTLY anywhere on an image! The overview image is CACHED prior to review allowing IMMEDIATE access to any part of the sample with the “feel of using a microscope”. An amazing large field of view of the entire microscope slide is produced within seconds. 2K or 4K display resolution available! The M8 is so revolutionary you have to “SEE IT TO BELIEVE IT!” Focusing and brightness correction is automatic with PreciPoint’s M8 to quickly produce high resolution images. Auto focus at any time or manually override the presets. Adjust gamma, sharpen, enhance in split seconds. Annotate, draw and share all or selected regions of interest (ROI) in real-time. Use either 20x, 40x or 60x Plan Apochromatic objectives. Easily interchangeable in seconds and pre-aligned! No time consuming re-calibration needed. Besides real-time scanning the M8 is also one of the few products capable of scanning oversized and non standard 1 x 3″ slides. Perfect for antique slides from the past! Archive slides can come in many sizes. The adjustable slide holder accommodates a variety of slide sizes including 2 x 3″ veterinary slides. Most competing scanner manufactures have ZERO tolerance when it comes to slide holders and as such only slides 10 years old or newer will work. The PreciPoint M8 digital microscope enables you to work from anywhere at anytime. Access and operate the M8 remotely and in real-time (telepathology); connect, share and discuss your findings with your colleagues and specialists from all over the world. “The M8 is the ‘missing link‘ when it comes to remote control microscopy, pathologists have needed it for years!” according to Dr. J.B. Askew, Houston, TX. An overview image will facilitate finding your areas of interest. M8 also has the capability of reading slide barcodes. Select the area that you want to scan by toggling our selection tool. Then, choose among the different scanning modes depending on the quality and efficiency you want. Partial, as well as full whole slide scanning is possible with our SlideScan mode. Once your slide is scanned, use our free slide viewer software ViewPoint to view the sample. Zoom seamlessly through the slides with your fingers, enabled by the concept of intuitive operation. Annotations, measurements, multiple fields of view, and other software based applications empower you and your work. The M8 is not only a microscope, but a digital scanner at the same time! 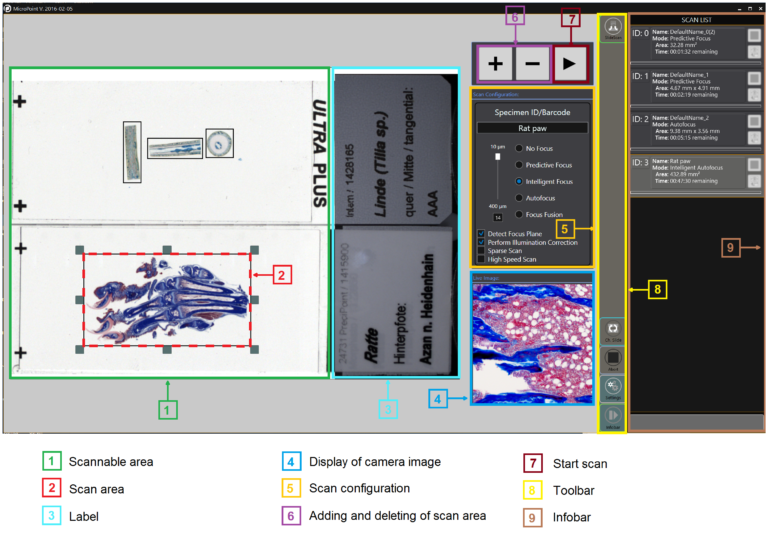 Slide Scan offers five microscope slide scanning modes along with other features. These scanning modes vary in speed and quality, giving you the option to choose the most appropriate scan configuration for your needs. 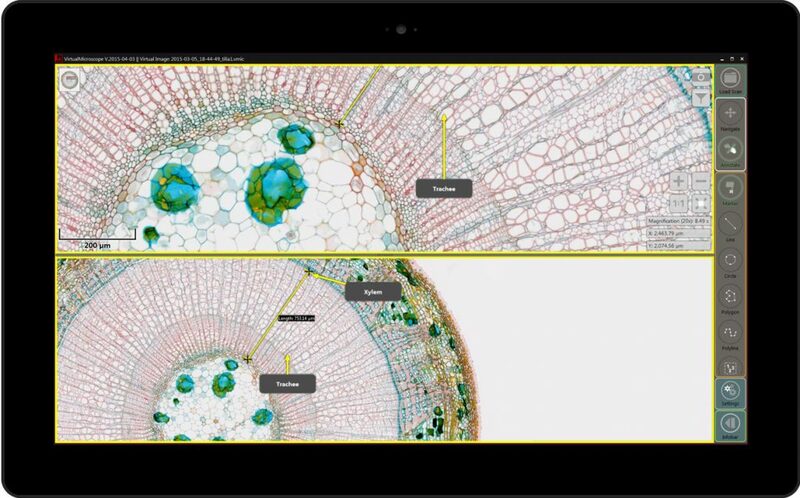 In Slide Scan mode, the M8 immediately provides a large thumbnail overview of your microscope slide. With this overview, it is possible to mark the scan areas, rather than scanning the entire slide to save time. In order to select the best scan configuration for digitizing your microscope slides, it is necessary to first examine the sample. Use the Live View Mode or Instant Scan Mode to assess the slide topology, or the evenness of the slide. Depending on the topology, it is possible to determine whether a small or large focus range is necessary. An even slide with many focus regions will require a smaller focus range, while an uneven slide requires a larger focus range. After evaluation, go to Slide Scan mode and determine the Scan Configuration to choose your scan modes and to select your scan features. A unique feature of the M8 is that it has the possibility scan even “unusual” slides. Slides with a special “thickness” or samples embedded in plastic are all possible to be shown with clarity. 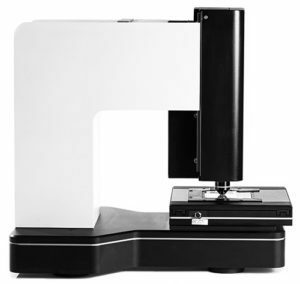 In addition, even large microscope slides – from 25 x 75 mm (standard) up to 50 x 75 mm (large) – can be scanned with the M8. No Focus: This is the fastest scan mode and specifically suitable for completely even-surfaced or flat samples. In the few cases that the sample is focused throughout the slide, the M8 runs autofocus at one selected point, then scans the image without changing its Z-position during the scan. Predictive Focus: This mode is for relatively even surfaced samples. M8 uses different focus points to extract a best fitting focus plane for the scan. Then the M8 drives along this abstracted focus plane while scanning the slide, without changing its Z-position for each tile. Intelligent Focus: This is the default mode of the scan configuration and usually the best option in balancing speed and quality. Just like in the Predictive Focus mode, the M8 uses focus points to estimate the best fitting focus plane to drive along with its Z-position. Then, additionally in the Intelligent Focus mode, it is necessary to specify your focus range between 10 and 400 micrometers, based on the slide topology. The focus range determines how much the Z-position should drive vertically in either direction for each tile scanned during the scan. As the Z-position drives along the z-axis, M8 finds the sharpest focus point in the specified range to select the best image for your digitized slide. Autofocus: This mode delivers exclusively focused images and is especially suitable for slides with large differences in height. Just like in Intelligent Focus, it is necessary to select the focus range in which the M8 runs its Z-position along. However, it does not abstract a focus plane to run along, but rather focuses each tile starting at the same determined point on the z-axis. Focus Fusion: This mode is exceptional for very uneven objects on the whole slide. Just like in the Intelligent Focus and Autofocus scan modes, focus range must be selected. However, in Focus Fusion, as the Z-position drives along this range, it is not selecting the best image, but rather collecting the best pixels from each individual image, among the stack of images. Then, this scanning mode merges the best pixels as one fully sharp image, thereby guaranteeing the best possible focus beyond the “image” level, to the “individual pixel” level. Detect Focus Plane: This feature is selected by default. M8 will use a focus point to detect the approximate location of the sample before starting the scan. This is generated using our own algorithm, and can also be adjusted manually. Perform Illumination Correction: This feature is selected by default. Illumination Correction homogenizes the background illumination to eliminate the uneven tiling pattern. 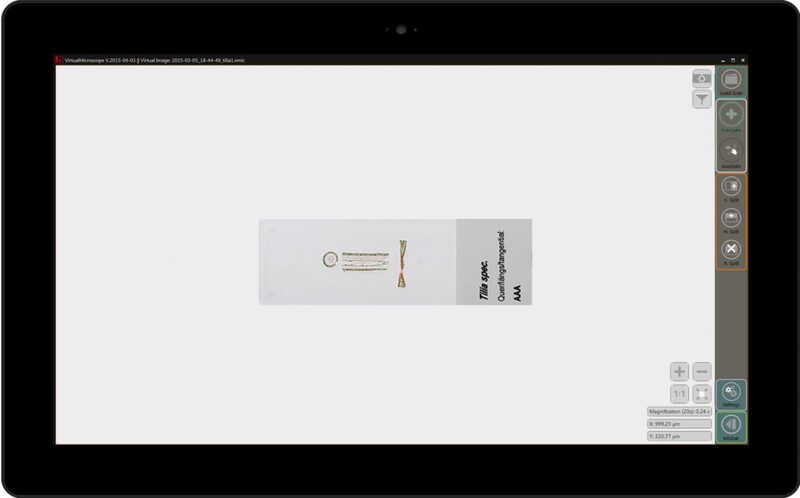 To do this, the M8 identifies a whitespace, or an area without a sample, on the whole slide. Then this whitespace is replicated throughout the whole slide to correctly light up the sample with the optimal illumination. The whitespace is determined using our own algorithm, and can also be adjusted manually. Once you select your scan configuration, begin scanning right away and view your scanned slides on ViewPoint – Our Free image viewer software. The "Smart Phone of Microscopy"
The PreciPoint M8 is for RESEARCH purposes only!